I’m super excited about this giveaway, because I love straws. Bendy straws. Loop-de-loop straws. Great big straws. Those itty-bitty straws you get in mixed drinks. Yep. I dig straws. But, sadly, when I got all green and eco-conscious and such, I quit using straws. They’re made of soft plastic. In other words, drenched in nasty chemicals and destined to sit in the landfill for eons. *sigh* Badness. But, apparently the love for straws is genetic, because the kiddo loves them, too. And, he always wants me to buy some for him. And, he’s always disappointed when I don’t. Glass Dharma straws come in 4 diameters: sipper, ice tea, smoothie, and bubble tea. We’ve found the ice tea size to be the most versatile. It’s wide enough to use in a smoothie, and small enough to use with juice. If you make your smoothies super thick or very chunky, you might want to go with the smoothie size. We’re not bubble tea drinkers, and did not try that size. And the sipper size? Perfect for kiddie cocktails (or the grown-up variety). They also come in straight, beautiful bends, and decorative dots styles. The kiddo requested the beautiful bends, and there was some complicated kiddo algorithm involved in the decision – something about height of glass and height of table and bend of the neck to reach the straw and such. So when we bought the straws, we only bought the beautiful bends. When Glass Dharma sent additional samples for us to review, they sent 2 of the decorative dot variety, and the kiddo’s algorithm fell apart. Decorative dots rose to the position of “most beloved.” The shorty sipper decorative dot is now the most coveted straw in the bunch. Your kiddo mileage may vary. So, now that you know I love these straws, and the kiddo does, too, I’d best give you a kiddo creation with which to enjoy them, right? Put all ingredients in the blender and blend until smooth and creamy. Please note that Glass Dharma provided free products for me to review. I was under no obligation to provide a positive review, nor did I receive monetary compensation. All opinions expressed above are solely my own. This entry was posted in bananas, coconut, drinks, grain-free, Product Reviews, raw, spinach, vegan. Bookmark the permalink. My HEALTH! The world’s HEALTH (reusable)! My daily green SMOOTHY! I love that glass dharma straws are environmentally friendly! Oh wow! I too love straws but have mostly given them up because of how bad they are for the environment (except two extra thick plastic straws that I keep washing and re-using). I’d love the chance to have a glass straw for my smoothies! First – amazing looking smoothie! Anything with chocolate and cherries is bound to be wonderful. Second – I’ve missed straws! We used to go through too many plastic bendies with our smoothies but these are guilt free and gorgeous. Can’t wait to check their site. I love the fact that these straws aren’t drenched in awful chemicals! I follow The Mommy Bowl on Twitter. I follow Glass Dharma on Twitter. I have been really wanting to try glass straws! I LOVE that these make it so we don’t have to sip our drinks through gross plastic!! I’ve not seen these until now and would love to try them. I like drinking my smoothies through a straw, but dislike cheap plastic ones. I would love to give my children straws to use that are not toxic. I love the idea of a reusable straw! I just don’t enjoy my protein shakes as much if they aren’t consumed via straw, so one of those iced tea-sized straws would be amazing. I love that the straws are environmentally friendly. I love that they will replace broken ones. Cool giveaway! I love glass straws! I can’t drink a smoothie at home without one 🙂 It’d be great to have another one on hand so Matt and I don’t fight over who gets it! – Follow you on Twitter. I like that they’re environmentally friendly and that they have a guarantee against breakage. I like Glass Dharma on FB. I’m following Glass Dharma on Twitter – DucktorWho82. I like the lifetime guarantee against breakage and the fact that they are reusable! I use straws everyday…I love how environmentally friendly they are!! Thank you for the giveaway! I’m sorry I totally misread your directions 🙂 I like both of you on FB and follow you both on twitter! I like that they offer smoothie straws – smoothies are the only thing I use straws for, and my previous experience with (borrowed) glass straws proved unsatisfactory for this reason. I really like the idea of a re-useable straw. It annoys me to buy something, use it once, and throw it away. These glass straws are lovely! Oh I’ve been drooling over these straws forever! I would love to have one of my own to drink my smoothies out of! And hopefully not drop it with my klutzy (non)butterfingers.. I love that it’s glass — not full of plastic chemical nasties. I love that it’s not going to add to the landfill and that they are guaranteed. Actually tried to buy one near me but the store was out. Sob. 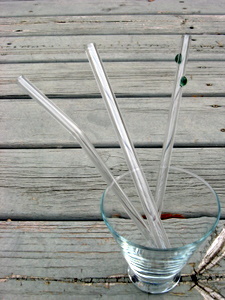 Wow – glass straws – would love to be a winner. These would prove to be a hit in my house as I don’t buy plastic straws any more. Just found your blog recently. So glad that I did. I like the lifetime replacement guarantee that Glass Dharma offers. I like Glass Dharma on facebook and follow on twitter. I Like Mommy Bowl on facebook and follow on twiiter. I just recently heard about Glass Dharma, and I have to say, I am really excited to try out one of these straws! They look beautiful, are multi-functional, and are eco-friendly! How much better can it get?! !